Brought to you by An_Old_Sock, the author of the in-development Moonpath Reborn, Moonpath to Elsweyr is enjoying regular updates for the first time in five years. 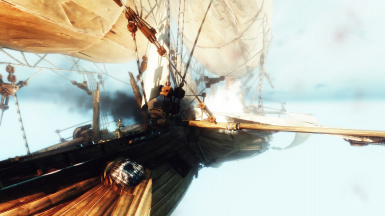 With numerous bugs having been squashed, graphical quality vastly improved and a number of user complaints tended to. This is the most comprehensive Moonpath experience to date. Permission to upload and carry on the legacy of this amazing mod was giving by the original author, muppetpuppet. Muppetpuppet's only request is that the mod and its assets remain Forever Free. 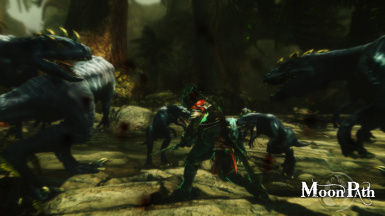 That means you may not alter, or use assets included in Moonpath to Elsweyr for paid mods. -- Everything included in the version 1.0 release of Moonpath to Elsweyr is credited to muppetpuppet. Later versions are credited to Illiani aka An_Old_Sock. 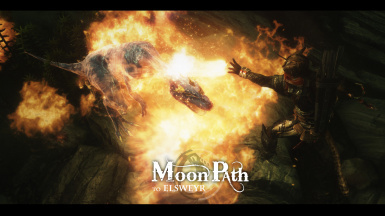 -- Typo Fix - Moonpath to Elsweyr has been merged into the mod with the generous permission of Treacleman. -- moss_SOK.dds is based on moss.png by Aaron Hoffman (http://zanzindorf.com/) and is covered by a Creative Commons Attribution 4.0 International License. -- JR's Immersive Start Patch has been hosted with the generous permission of Treacleman. -- Re-educated 2 Bandits from 1st Desert Environment so they don't get stuck behind their tent. -- Added script to fix potential bug creating a perma aggressive, unkillable Sload OF HORROR! -- [XBOX] Corrected issue with upload. -- Removed a handful of wild edits. -- Changed music in a handful of locations to remove constant combat music loop. -- Moved, or removed, opponents near player transitions. -- Adjusted mortality of one opponent to remove quest break. Will need to go back and adjust this further. Changed EID for all custom cells to fix saves failing to sort by character. -- Fixed one incorrectly named mesh. -- Removed static "anvil_moon" as this referenced a non-existant mesh. -- Included change log in download archives. -- Renamed a handful of locations to remove save bug. -- Removed mod-specific changes from the Deadman's Drink. -- Solved the Strange Case of the Teleporting Caravan and its sequel the Incredibly Infuriating Case of the Vanishing Caravan. -- Placed NPCs, which previously appreared in the Deadman's Inn, and their now non-teleporting, non-vanishing caravan into the outskirts of Falkreath. Look for them near the main gate (turn right out of the Deadman's Drink). -- Refreshed & hand-edited all meshes to ensure Skeleton Bug & CTDs do not return (both were caused by meshes corrupted during automated conversion). -- Adjusted water template in all locations with water, with the possible exception of one dungeon. -- Improved lighting in all areas, except one dungeon. Most locations have their lighting completely rebuilt. Further lighting enhancements (other than minor tweaks) are not possible until I rebuild each location due to the limitations of the original mod. -- Adjusted music template in several areas. -- Adjusted accoustic template in most areas. -- Adjusted screen effects template in most areas. The following includes changes confirmed to be present in the upcoming v1.13, but may be removed prior to release if issues emerge. Currently the ETA for v1.13 is by end of day on the 18th (UK time). 2k optimised textures included by default, with 1k optimised textures relegated to an optional download for those of us with potato computers. Over 250 lines of tweaked and adjusted for better English & consistency. Forest Spider poison nerfed by roughly 89%. Forest Spiders will no longer come equipped with an almost unresistable poison which paralyses you for nearly 30 seconds. Crab Meat's effects now match its description. Reordering of numerous dialog menus for consistency. Item descriptions removed from those which would not normally have them in the vanilla game. A number of location names edited for consistency. Version 1.12 is a Hotfix which solves the issue people were having with custom creatures suffering from mesh distortion. 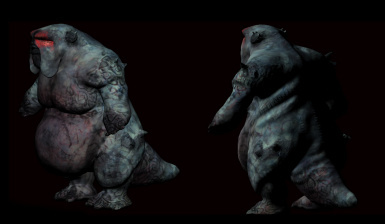 While initially the problem was believed to be with Moonpath's custom skeletons in the end it turned out to be corrupted body meshes. Sadly the automated method I was using to convert the meshes was causing them to play poorly with the creature's skeleton. The solution was to convert them by hand (thankfully this didn't take too long). v1.13 was been rolled back to v1.1/2 due to reports of CTDs post-release. v1.14 will still be the next release, however larger changes planned for v1.14 will be pushed back to v1.15 due to priority changes. A Construction Kit bug meant npc face data, sounds and custom voice files were not being packaged into the BSA. I have manually built the BSA to ensure that these files are now present. Merged main BSA and Textures BSA into a single file. These will be seperated again in the next version. Renamed Voices folder to reflect plugin name changes (Moonpath.esp from Moonpath.esm). This was a really dumb mistake, sorry everyone. ESP & ESM converted to SSE in CK64. Meshes & textures optimised for SSE. ESP & ESM merged by hand using xEdit. Changes from Unofficial Patch forwarded in xEdit. Manual & automated error checking in xEdit. Quick bug testing in game. QA testing is not my strong point. Travel the hidden path from Skyrim to Elsweyr! Emerald jungles and cerulean skies! 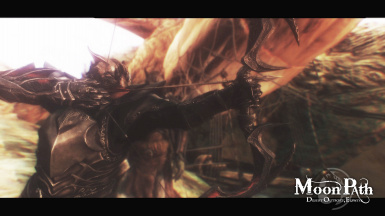 Moonpath to Elsweyr was one of the first quest mods ever released for Skyrim. Its origins dating back to before the original Creation Kit was even released. Despite Skyrim modding being in its infancy MuppetPuppet was able to bring Elsweyr to life in a way never before imagined. 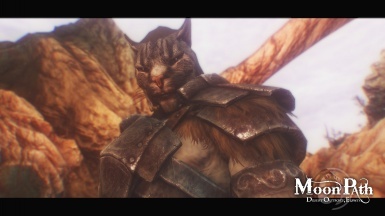 Moonpath to Elsweyr is an old mod, created over half a decade ago. Its development utilised a number of techniques no longer used today. This has resulted in a lot of bugs, or things which might seem strange to modern players. While some of these issues can and will be fixed with time, the process is much longer than it would otherwise be. So if you encounter bugs please let me know, providing as much information as possible. MuppetPuppet, the original author of Moonpath to Elsweyr. It is an honor to be able to continue his legacy. 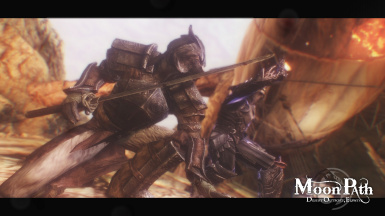 I am incredibly grateful for being able to merge his mod into Moonpath SSE. Treacleman is actually a real life author of real life books (fancy bugger that he is). So if you're a fantasy or science fiction fan (lets face it, you are) make sure to check him out! Shadowkat678, friend, xbox playtester and PM spammer. Helping maintain my sanity and stopping me raging on Bethesda.net.